Chain of Command will have a Rhodesian Bushwars supplement at some point, so some new miniatures were in order. 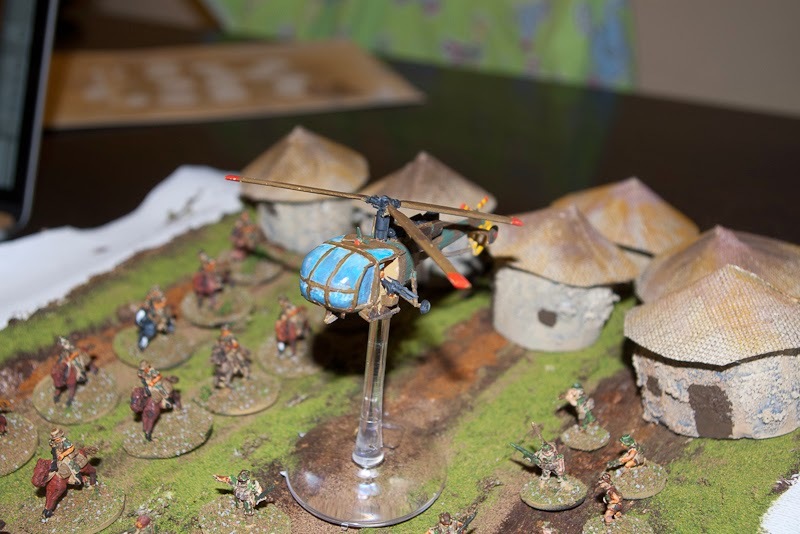 Bongolesian irregulars do nicely for insurgents, but we were little light on regulars and helos, so I started with those. Chain of Command needs only a reinforced platoon and Rhodesian platoons are usually quite light on manpower, so task is not that huge. Old Glory supplies me with a platoon of Fireforce 15mm Rhodesian (sculpts are nice and lively, cast was terrible. Lots of flash and those annoying lines where halves of the miniature do actually not meet.) and an Alouette III from Little Flyin' Fockers-range. Probably the worst kit I have seen in ages, even if the result is passable. around 30 unnumbered pieces of metal and resin, so much flash that it is sometimes impossible to see what parts should be cleaned and what binned. And instruction sheet that actually had my wife laughing out loud when she saw that. Half a dozen reference pictures and lots of dremeling later the result is ok'ish. Fortunately the resin was on the soft side, so easily carved with knife and dremel. And a platoon of Grey's Scouts from Peter Pig. These were standard PP stuff, next to no flash and ok poses, much preferred after the previous lot. Rhodesians and some quickly cobbled together huts. Bobby the gunner suffered a lobotomy and lost parts of his backside to actually fit inside the g-car gunner position, but hey, groundpounders will appreciate his sacrifice. 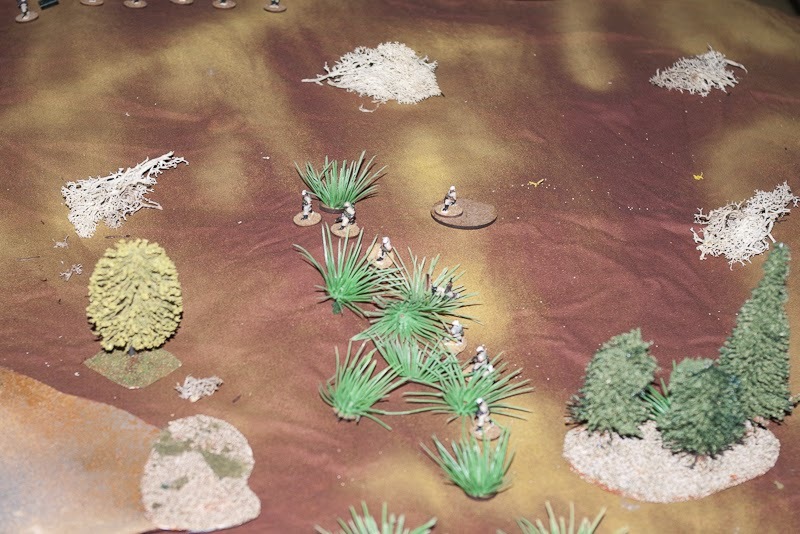 First test game pitted ZANLA cadres against Rhodesian army regulars. 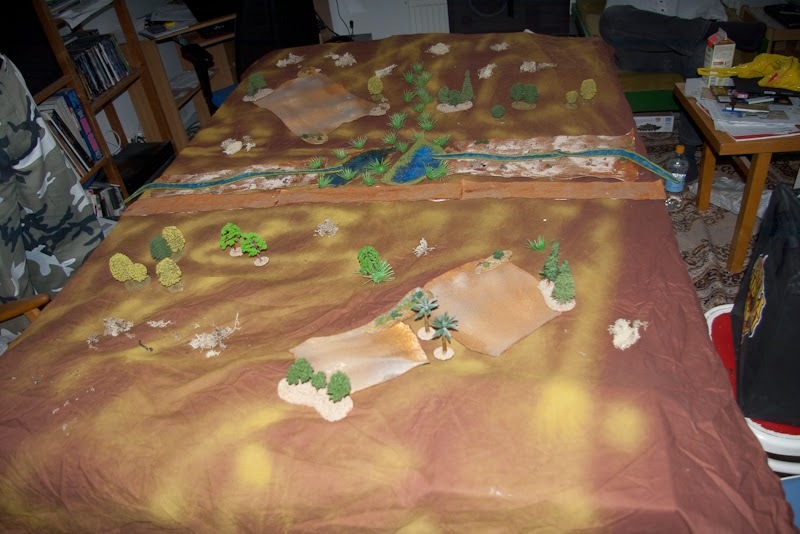 Both forces were patrolling along a small river. SF forces were tasked to find and engage, whereas ZANLA did not want a heavy engagement. Patrol phase saw a brilliant trick pulled by SF commander as his advances strongly along one flank. Taking the higher hillside allowed him to fully utilize his significant firepower advantage. Jump off points in circles, dispersal points in solid red. Of course, plans rarely work fully. ZANLA suffered horrible casualties, but clinged on while their sniper kept the SF forward section pinned. And when it looked like ZANLA had finally had enough with a Fetter AC hitting them in the flank and base of fire running away, the braves of the forward section charged forward and cut down the SF rifle team to man. SF player promply failed all possible morale checks and was forced to fall back, leaving bloodied ZANLA as the victor. The deployement below cost the game to SF. By deploying in the cover of elephant grass, SF troops left ZANLA a small and narrow passage out of LOS (coming from the bottom of the image) , which they promptly used.